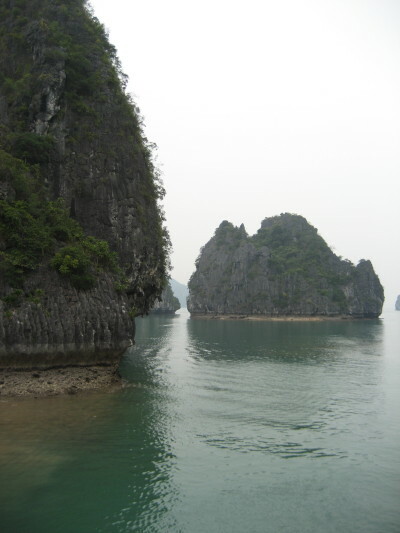 Chengdus & Don'ts: Halong Bay Day ! 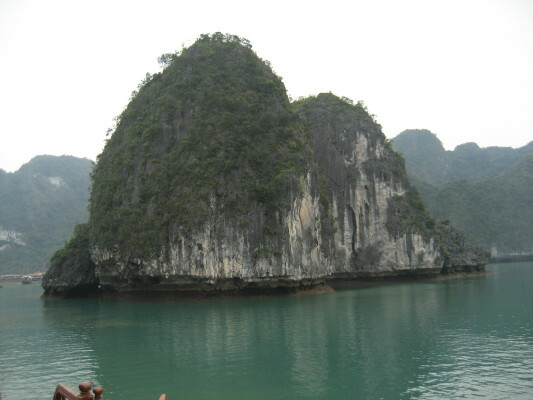 On Sunday we headed to Halong Bay to spend two nights. We left around 9 am and we were all feeling pretty good. About an hour into the trip poor Gemma vomited her breakfast in the back of our van which included 6 young Australians. I am fairly sure Gemma was just a little bit carsick and seemed to do fine after that. Jonny on the other hand was covered in puke. We managed to get the driver to pull over so we could clean up the Gemma, Jonny, and the van. 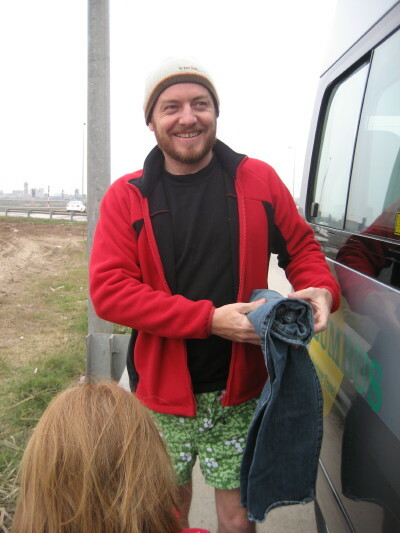 Here is Jonny changing his jeans at the side of the road. 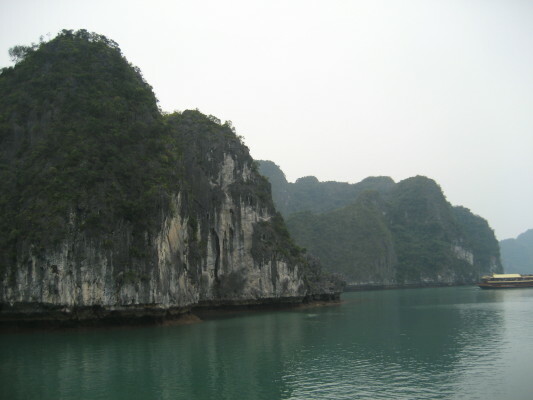 We got back on the road and arrived in Halong Bay promptly at 12:30 pm. 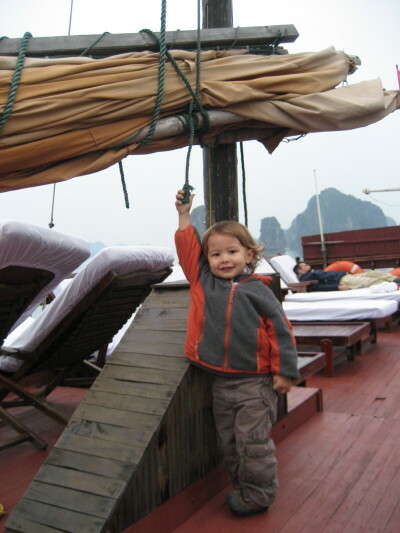 We boarded a small boat which then took us to Santa Maria Cruiser that we would be sleeping on for one night. 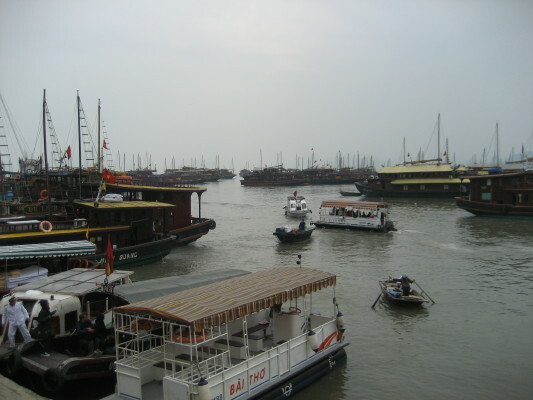 Here is the harbor packed with boats. Here we are getting ready to go to the Santa Maria. 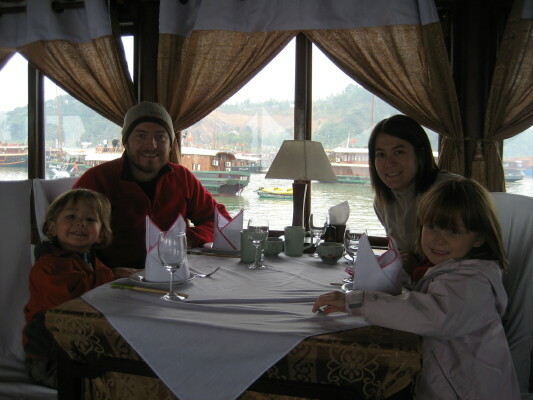 Here we are at our table on the Santa Maria. 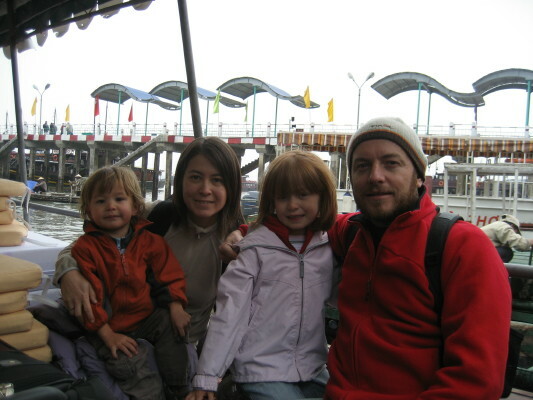 The kids were so excited to be on a boat especially to be sleeping on a boat. 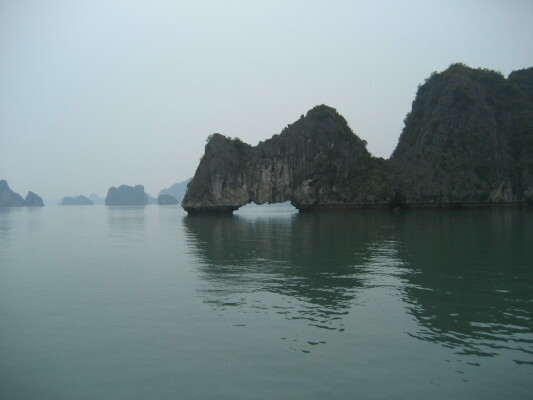 We were excited to see the beautiful limestone rocks and emerald waters of Halong Bay. None of us were disappointed with this day! 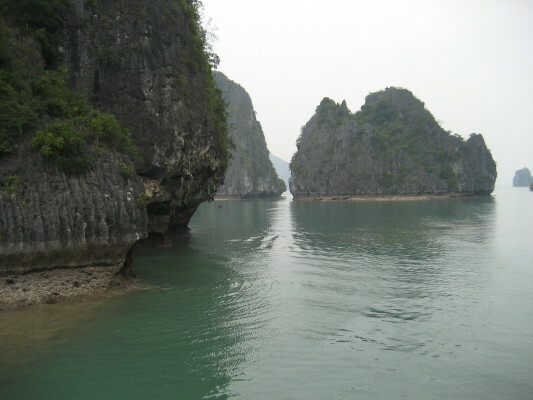 The kids had the time of their lives and we enjoyed picturesque Halong Bay. Here are some are some photos from the day. 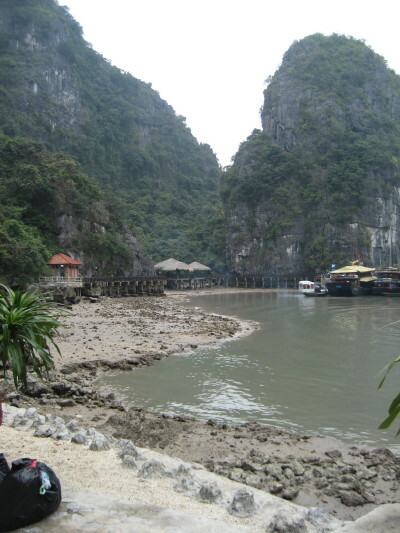 On the water were many sea gypsy villages. 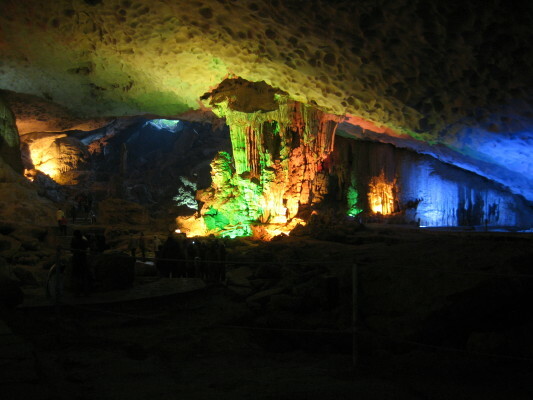 Many of them make their living off tourism. Ever time we got off the boat there were boats coming up to our boat trying to sell us things. 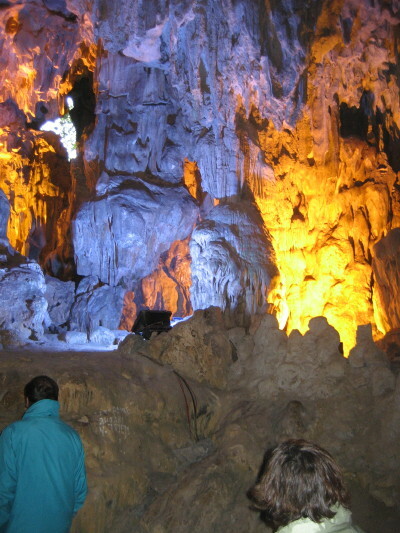 At this stop was a gorgeous cave with stalactites and stalagmites. Here are some pictures from our little tour. 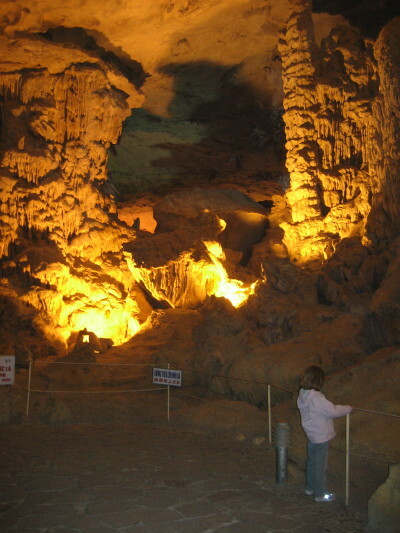 The pictures didn't turn out the best, but the cave was definitely worth seeing. It was also a good chance for the kids to stretch their sea legs! 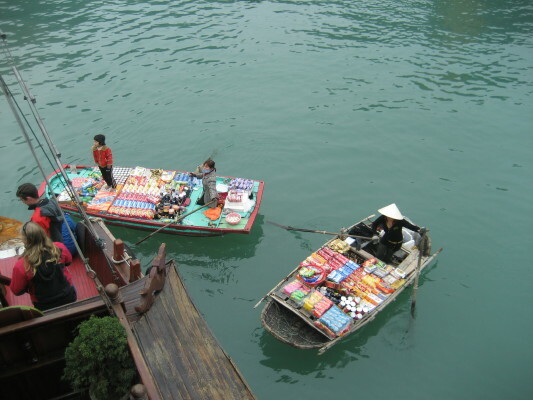 A site I saw very disturbing while on the boat was the young children from the sea villages rowing around the tourist boats begging for money. I estimate the boys on this boat were between the ages of 4-6 years of age. I can't imagine letting Gemma and Angus rowing a boat around the ocean like this. 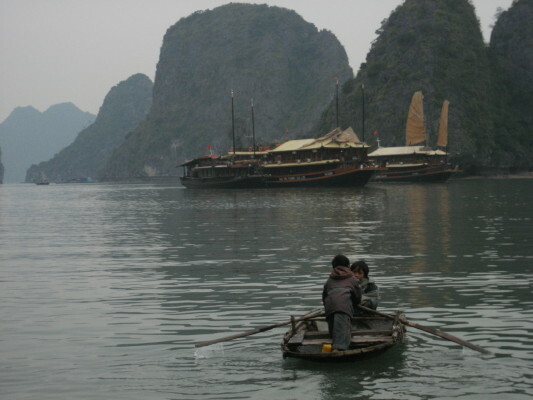 After a great day in Halong Bay we ended with dinner. 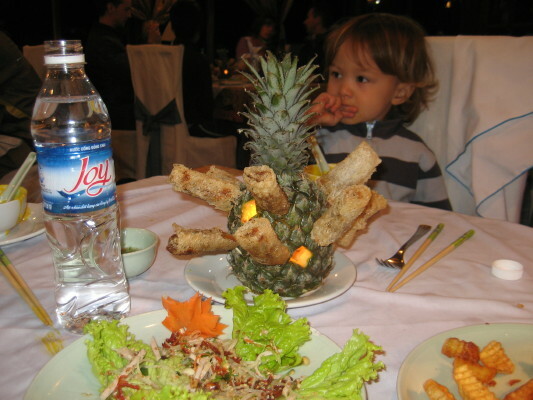 Here are our spring rolls served in a pineapple.